﻿﻿﻿CCAP Blantyre Synod in partnership with Save the Children International is implementing a two year project to promote girls education under the Keeping Girls in School (KGIS) programme with funding from UKAid from the UK Government. The programme aims at improving the school experience and environment for adolescent girls in programme areas and will work very closely with the Ministry of Education, Science and Technology, Ministry of Gender, Children, and Social Welfare, as well as agencies implementing the other strands of the KGIS programme. The mission statement of the Education Department is derived from that of the Synod. The Blantyre Synod Mission Statement: "The proclamation of the Gospel of Jesus Christ for the salvation of mankind, the shelter, nurture and spiritual fellowship of the children of God; the promotion of divine worship, the preservation of truth, the promotion of social righteousness and well-being of mankind." Education for Living. In pursuance of this mission, Blantyre Synod aims to make effective and efficient use of available resources to develop the spiritual, physical, social emotional and intellectual capacities of each child and young person to become fulfilled and productive citizens of Malawi. In view of this Mission, the Education Department aims to develop and implement models of Education for Living that will help prepare and equip the primary and secondary school leavers with professional and vocational skills which will make them self-reliant. Education Institutions There are about 265 Primary Schools, 39 Community Day Secondary Schools and 3 conventional Boarding Secondary Schools. Almost all of these schools are run by the Government. However, in recent times Blantyre Synod has taken back the management of its three mission schools: HHI (Henry Henderson Institute), Neno school for girls and Domasi Secondary School. The disticts of the Synod are divided into Educational Zones which are managed by Supervisors who are called Primary Education Advisors. Each such advisor is responsible for 10 schools. The schools are headed by Head Teachers who are employed by the Government. The Synod Education department works in collaboration with the Government in many areas such as the curriculum, the well-being of the students and school resources. The Synod Education department is also involved with the School Committees and with the Parents - Teachers Associations. Seminars for teachers on teaching skills. Providing guidance to school committees on communication with the communities in which the schools are placed. Facilitates form one entrance examinations to CCAP Schools. Participates to meetings organised by the Ministry of Education on policy and curriculum. The second school in Malawi (the first being one opened at Cape Maclear by the Livingstonia Mission) was opened here in Blantyre in 1876 within a few weeks of the missionaries settling here. For a long time in Malawi, the Church had the primary responsibility for education. In Central Africa, the Christian Church has grown out of the Christian School. The first teachers were the missionaries themselves and pupils who became teachers. Later on the teachers were church elders. One of the principles of the school was that of in-service training. Teachers were going to school in the morning, and would teach in the afternoon. The school was based on the principle of equality in all forms of training, a kind of comprehensive education. Carpentry, building , printing and agriculture were taught at the Blantyre School. The local chiefs would send boys and girls to be educated and learn at the school on Blantyre Mission. There they were thought about Christianity and also received western education. The chiefs requested to have schools in their own villages. "Build your own school and we will send a teacher." Many out-stations/ out-schools were built: Chiradzulu, Chilimoni, Domasi, Mlunguzi, Matope, Mlunguzi. So Blantyre Synod expanded its education further into the Southern region. Today there over 300 schools through out the Southern region of Malawi. Students from out-schools would come to HHI (Henry Henderson Institute) for their examinations for the Primary School Certificate. HHI did not only offer academic education but technical training in carpentry, building, printing, and agriculture were given in the buildings beyond and alongside the Hetherwick Press House. Apprentices were incorporated into HHI and lived in the HHI boarding houses up until 1956 when technical apprenticeship training was discontinued after the opening of the new Government Apprenticeship Training School at Soche. 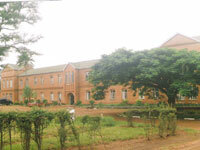 HHI (pictured above) was at that time and in many years to come providing the highest level of education available in Southern Malawi equalled or surpassed only by Livingstonia Overtoun Institution in the far north.